Pay $14.40 for the black New Balance long sleeve shirt (the other colors are higher priced) from 6pm.com and get back $4.80 from Shop at Home, for a total cost after cash back of $9.60. You must go through Shop at Home for this deal. Sign up below! 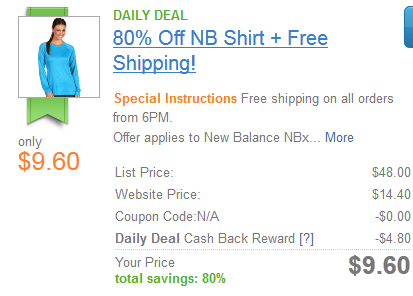 The deal is located on the front page, but if you can't see it simply search "6pm" and then shop from there.